Description: 99/00 game worn St. 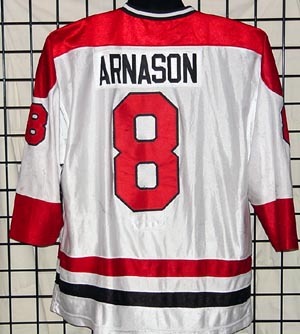 Cloud State University hockey jersey, worn by Tyler Arnason, K1 Sportswear Alternate Dazzle Cloth, shows nice wear, original nameplate, At SCSU: 1999-2000: Ranked eighth in WCHA scoring, sixth in assist scoring...All-WCHA second team selection. 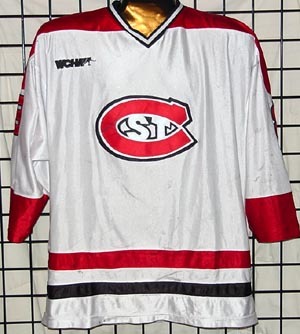 1998-99: Won the Roland Vandell Award for Outstanding Freshman...Named to the WCHA All-Rookie Team...Huskies top scoring rookie with 14 goals, 17 assists in 38 games, an awesome jersey!